The Strawbridge Observatory at Haverford College, January 2013 (Click for full size image). The current Strawbridge Observatory was built in the early 1850s, replacing the original, wood-frame observatory that had been constructed for John Gummere in the 1830s (records seem to indicate different dates for this original building). 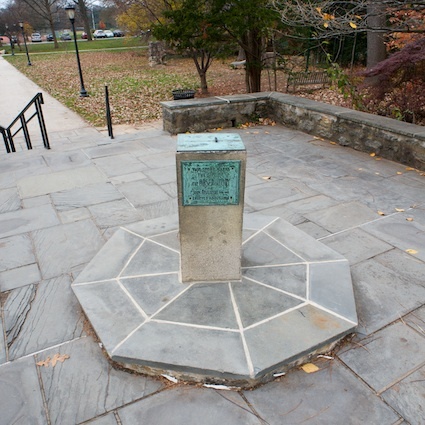 A pedestal capped by a now broken sundial marks the location of Gummere’s observatory (see this post for more on the sundials around Haverford College). A second dome was added to the Strawbridge Observatory in the 1880s, when the college acquired a 10-inch refracting telescope. Then in the 1930s steel doors were installed as part of a major renovation project. During this project the architects preserved the concrete slab that both marked one of the original equatorial mounts and the donors’ names (so I was recently told). Apparently, the college’s original telescope—a refractor built in the 1830s—is still in one of the observatory rooms (this too was recently related to me—stay tuned for an update on these issues). Today students use a 12-inch and 16-inch Schmidt-Cassegrain to look up at the heavens, at least when cloud cover doesn’t prevent it. Astronomy has long been the backbone of science at Haverford and and remains one of our celebrated subjects. While the construction of an observatory served to demonstrate the college’s commitment to science, it came during a period when colleges across the country were constructing observatories. 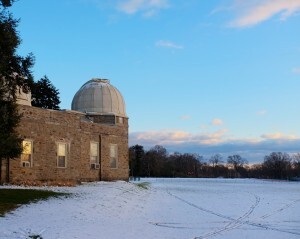 Haverford’s observatory is as much an expression of the 1830’s institutional Zeitgeist as it is evidence of a profound commitment to scientific activity.